Urban Keussen was born in 1964 in Bonn, Germany. He studied physics at the university of Kiel and received his doctor’s degree at the field of applied physics. In 1993 he started his career at PreussenElektra at the department Grid Planning and System Operations. After PreussenElektra and Bayernwerk AG merged to E.ON Urban Keussen became Managing Director for the technical resort in 2003. 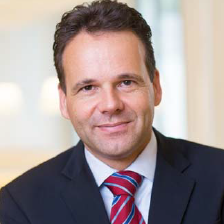 Between 2010 and 2014 he was responsible for technology and innovation as Senior Vice President at E.ON SE. Since October 15 2014 he is Vice Chairman of TenneT Holding B.V., Arnhem, as well as Chief Executive Officer of TenneT TSO GmbH in Bayreuth.